English Masoretic scholar and Christian missionary; born at Warsaw Dec. 25, 1831. He was converted in 1846, and was for a time connected with the Liverpool branch of the London Society's Mission to the Jews, but retired in 1863, devoting himself entirely to literary work. Besides editions of the Song of Songs, 1857, and Ecclesiastes, 1861, he published essays on the Karaites, 1862; and Essenes, 1864; and a full account in English of the Cabala, 1865.He then devoted himself to Masoretic studies, publishing the text and translation of Elias Levita's "Massoret ha-Massoret" in 1867, and of Jacob b. Hayyim's "Introduction to the Rabbinic Bible" in the same year. He was elected a member of the Board of Revisers of the Old Testament in 1870, and devoted himself to the collation of all the extant remains of the Masorah, three volumes of which he published in 1880-86. 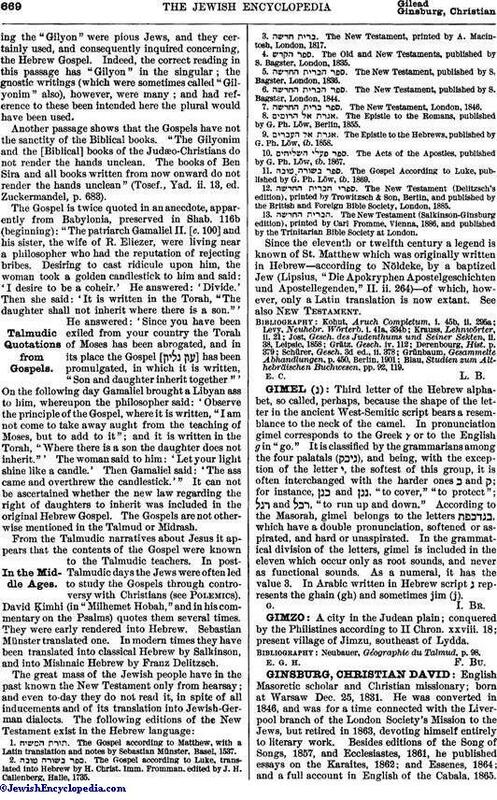 Based upon these collations, he edited a new text of the Old Testament for the Trinitarian Bible Society, which was published in 1894 under the title "The Massoretico-Critical Text of the Hebrew Bible." To this he wrote an introduction, published together with a volume of facsimiles of the manuscripts of the Hebrew Bible, in 1897. His method of settling the Masoretic text has been somewhat severely criticized by Blau in the "Jewish Quarterly Review" (viii. 343 et seq.). 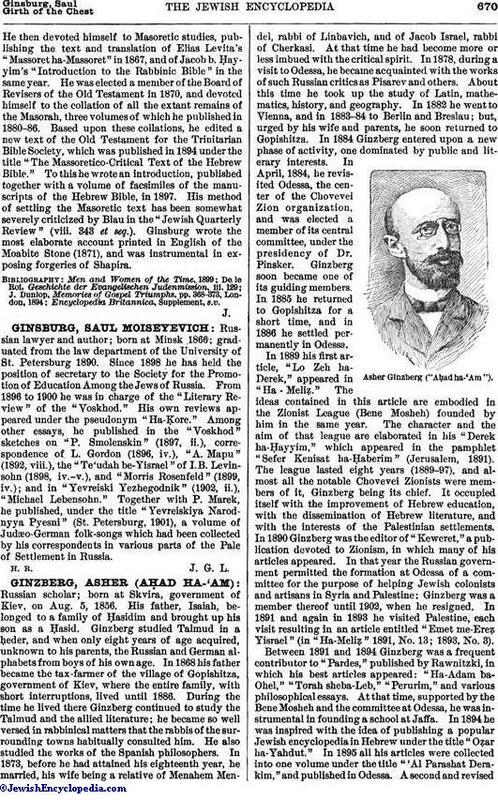 Ginsburg wrote the most elaborate account printed in English of the Moabite Stone (1871), and was instrumental in exposing forgeries of Shapira.